Sail the Adriatic Sea in style in this wonderful 2014 Jeanneau Sun Odyssey 469. 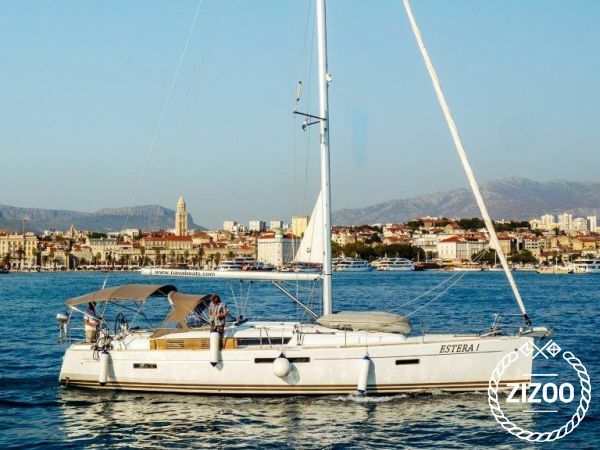 With 4 double bed cabins that sleep 8 comfortably, an additional 2 single berths in the spacious salon, 4 bathrooms and a fully equipped kitchen, there is plenty of space for you and your family to enjoy a carefree summer holiday on the Croatian coast. With air conditioning, a CD/MP3 player, a DVD player and a television, you can set sail without missing all the comforts of home. Based in Split, there are numerous lovely locations to visit including the medieval city of Trogir, the fascinating island of Vis, the mystically gorgeous Bisevo, and the charming island of Solta. Sip some wine on deck while the kids playfully do cannonballs into the turquoise blue waters. Spread out your towel and soak in the sun and enjoy the evenings while the waves gently lull you into a relaxed state. For more ideas and information, don't hesitate to contact the charter crew. some problems with the dinghy. die einweisung sollte intensiver stattfinden.